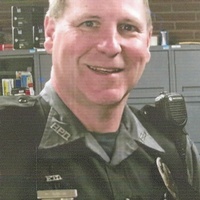 Officer Marvin Ray Gambill Jr., age 57 of Franklin County, Indiana passed away Friday, September 14, 2018 at his home. Born July 15, 1961 in Cincinnati, Ohio the son of Marvin Gambill and Norma (Henderson) Gambill. Marvin served the Harrison community as a police officer from December 4, 1987 to his retirement in December 2017. Married Donna Kerth September 10, 2017 in Franklin County, Indiana. Marvin was a member of The Ohio Horseman’s Council Inc., Ohio Farm Bureau, F.O.P. lodge #113, Police and Fire Retirees of Ohio Inc., McMillan Lodge #141 and the Scottish Rite of Cincinnati. Marvin is survived by his beloved wife Donna Gambill of Franklin County, Indiana, mother Norma Gambill of Saylor Park, Ohio, father of Michael Ray Gambill of Delhi, Ohio, Tayler Rae Gambill of Cedar Grove, Indiana and step father of Karl Joseph Bragg of Fort Thomas, Kentucky. Grandfather of Ryatt Biddle. Brother of Gary Gambill of Saylor Park, Ohio and Michael Gambill of Cincinnati. Visitation will be held Wednesday, September 19, 2018 from 4:00 P.M. until time of services at 8:00 P.M. all at Jackman Hensley Funeral Home 215 Broadway Street Harrison, Ohio 45030. Memorials may be directed to Cincinnati Blue Line Foundation 1900 Central Parkway Cincinnati, Ohio 45214, Old Friends Equine 1841 Paynes Depot Road Georgetown, Kentucky 40324.